the industrial design program at new york’s pratt institute partnered with italian furniture design company cappellini for the exhibition ‘perpetual motion’, which looks ahead to the future of furniture design. graduate and undergraduate students presented their concepts to cappellini and a team of industry professionals, who selected nine of the strongest designs for prototyping and exhibition at the international contemporary furniture fair 2011.
the lightweight ‘chair with belly button’ series, designed by taiwanese artist wang i chao, lets users more comfortably convert common spaces and materials into seating options. the pieces are placed onto the floor, steps, other chairs, piles of books, or any other sturdy surface to convert it into a place to sit. investigating ‘how two elements can communicate a sense of enclosure’, ‘dmc-12’, the work of new york designer edward hale, features clean lines and an unconventional hinging structure that belies its function. a lacquered case is set within powder-coated blue steel tubing, jointed so that the entire structure pulls forward and outward when the cabinet doors are opened. ‘the modularity’, by south korean designer kyung ho chang, relies on modular structure to accommodate ‘infinite variation in scale and finish‘, permitting an entire line of products to be produced from the same basic components. 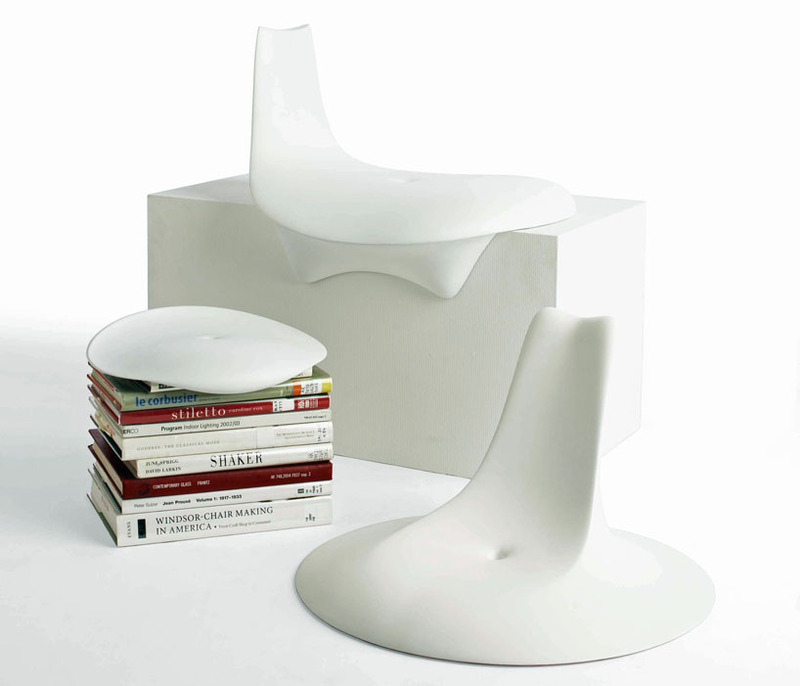 each module consists of a curved piece of molded plywood, surrounded by foam and upholstered. the independent elements are then connected internally to create a structural whole, raised on wooden legs. interested in infusing technology into furniture design, hong kong-born, US-based designer arnold chu uses LCD panels as ‘digital upholstery‘ in his mirrored chair ‘reflexion’. controlled remotely by computer, the panels permit the appearance of the chair to be easily changed, featuring images, video, or even motion-reactive graphic visualizations. ‘bundle stool’ by elizabeth joy wong image © armando rafael‘bundle stool’, created by american designer elizabeth joy wong, incorporates 196 squared blocks of pine with a foam foundation that lets the chair respond to the shape of its user. each wood piece lowers proportionate to the pressure applied to it, creating a seat that is comfortable, as well as one that challenges people’s assumptions on what materials should feel like. the ‘chipboard stools’ by hawaiian designer dana oxiles are composed exclusively of folded chipboard, stabilized with a small amount of glue and coloured with analine dye. her pieces include a range of the origami-like forms, in which chipboard is scored and bent into interlocking structural modules. oxiles explains that integral to her design is the goal ‘to elevate a humble material, so that it is read[s] as a chair before being read as sustainable‘. having explored folding as a basis for design in medical technology and fashion, taiwan-born, US-based designer li-rong liao adopts the profile to furniture in ‘folded felt table’. the piece features a fan-folded base of a single sheet of cardboard, covered in felt. ‘hk-stool’, the first furniture piece of designer chun chun, offers a minimalist interpretation of a stool design popular in her native hong kong.